For Father’s Day I made an easy and delicious pasta dish we’ve really come to enjoy around here. My photos of it were terrible and it really is delicious so here’s the image from The Food Network that seduced me into making it. You can find the recipe here. Or, if you’re too lazy to click, follow along below. Totally delish and quick. Excellent when you have alot on your mind. I used frozen meatballs myself. What? I just said I was lazy. 1/2 cup grated ricotta salata or parmesan cheese (about 2 ounces)DirectionsBring a large pot of salted water to a boil. Add the pasta and cook as the label directs, adding the broccolini during the last 2 minutes of cooking. 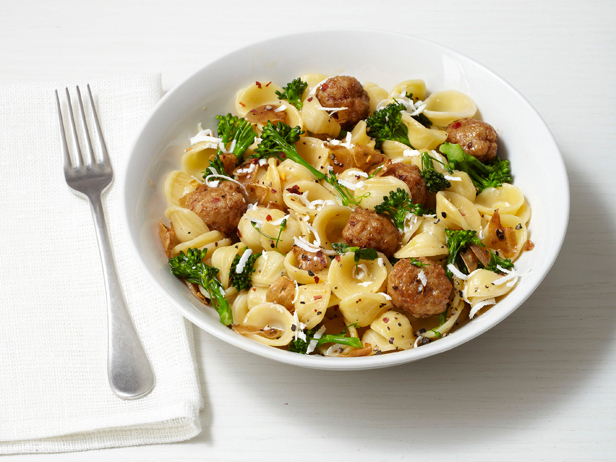 Reserve 1 cup cooking water, then drain the pasta and broccolini.Meanwhile, roll the sausage meat into about 20 small meatballs. Heat 1 tablespoon olive oil in a large skillet over medium-high heat. Add the meatballs and cook, turning occasionally, until browned and cooked through, 5 to 6 minutes. Drain on paper towels.Pour off any drippings from the skillet, then add the remaining 3 tablespoons olive oil, the garlic, red pepper flakes and 1/2 teaspoon salt. Cook over medium heat, stirring, 1 minute. Add the pasta, broccolini and meatballs. Whisk the egg with the reserved cooking water in a small bowl, then add to the skillet and stir until the sauce thickens slightly. Season with salt and pepper.Divide the pasta among bowls. Sprinkle with the cheese and drizzle with olive oil. This looks so good. I am going to make it the next time I have company over.